Description: To the left, a figure with cropped hair sits at a desk, using a laptop. There is a vase full of flowers on the desk. A crescent moon in the night sky outside can be seen through a window, and a black cat frolics on the floor. On the right, in a green field, four people stretch in preparation to play sports. Credit: Alia Sinha. A person with short hair and facial hair leans back against a pillow, holding a drink in one hand. 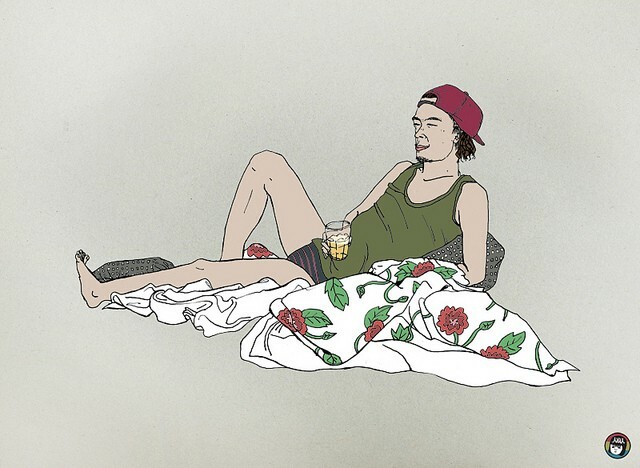 They are relaxing on a floral bed sheet, and wearing a tank top, underwear, and a cap which they have on backwards. Credit: Minjung Gang, via Flickr, CC BY-NC-ND 2.0. While technology helped me to read and connect with people, there was a silent revolution happening in my life. I was fortunate enough to meet a few people with disability who were engaged in sports. Even though I had made multiple cities my home, I never got an opportunity to participate in any kind of sports. My friends opened up a new avenues for me and helped me to overcome my initial inhibitions.